Mmmm... Basil Spinach Quiche Lorraine full of egg-y custard deliciousness and a flaky buttery pastry crust. I’ve been meaning to get this post written all week, however, I’ve been rather busy. Oh wells, life goes on. The other night we were craving some brownies. I typically insist on making them homemade, because I’m a purist like that (and they are JUST as easy to make with less artificial ingredients), but I happened to have a gluten free Bob’s Red Mill brownie mix in my cupboard that could afford to be used. To my horror we were out of eggs though, so I made the trek down to the store to get some more. I was in luck because they had free range vegetarian fed eggs on sale – two cartons for $5. I don’t see that pricing very often around here for non-conventionally raised eggs, so I obliged and picked up two cartons even though there are only two of us who hardly eat our weight through eggs in a typically week. I figured somehow I was going to find a way to use up these eggs even if it required a week of nothing but deviled eggs. Heh. I’m not that evil. Enter good idea #1: Quiche. I have to say that I haven’t had many affectionate feelings towards quiche, although I have tried my darn hardest. I like the little mini ones that my mom used to make when she owned a tea shop years ago, but the moment you start talking the 9″ pie sized quiches I get a different idea in my head. It isn’t that the idea of buttery pastry and egg-y filling with delicious mix ins are the issue – it is more the texture of said egg-y filling that I haven’t been a fan of. The large ones always seemed to have a “watery” texture, and I wasn’t sure if that was a consequence of not baking properly, not baking long enough, or using fillings that give off too much juice during baking which ensued an undesirable “watery” texture. That said, my idea of quiche was transformed a few years ago when I was a starved college student held up at Tea Zone in Portland (If you live in the Portland, OR area you MUST check it out – it’s an awesome tea shop/lounge in the Pearl District). I don’t know if my long hours of studying translated into some type of self-induced hallucinations when I must have quite mistakenly ordered a quiche (or perhaps I thought I had ordered a crumpet, or scone). Either way, no harm nor foul was done to me through subsequent bites (ne scarf-age) of decadent buttery pastry and light egg-y goodness. Quite the opposite actually. My delightful experience with Quiche Lorraine from Tea Zone entirely changed my outlook on quiche. 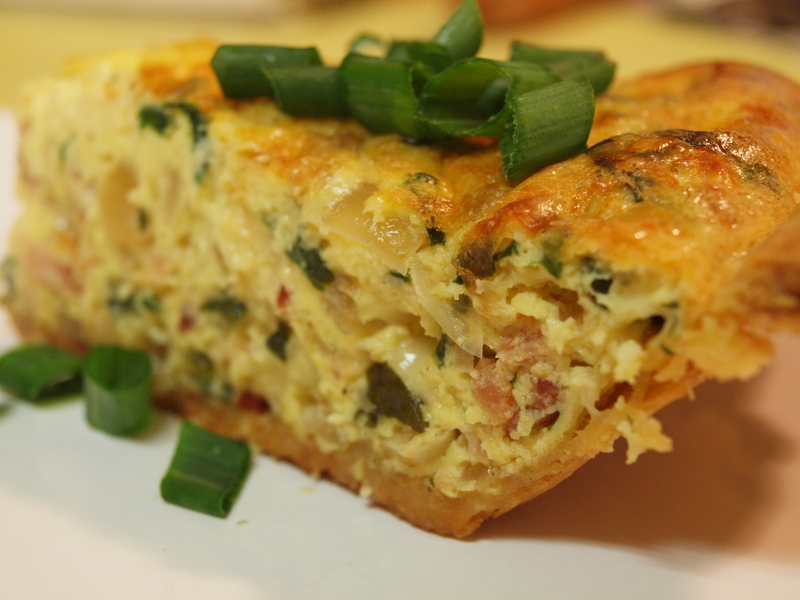 BEWARE: This recipe or a visit to Tea Zone may just change your mind about quiche as well. So, If you are quite happy hating on quiche, then you better be on your way. Shoo! My husband wasn’t too thrilled at first mention that I wanted to make quiche for dinner. That’s ok, I pushed ahead. Besides, I knew I could change his mind, and I had eggs to use up damn-it! After it came out of the oven and we dug into it, he was whistling a different tune and went back for seconds, or thirds… He just wasn’t thrilled to take it for lunch the next day so all his macho buddies could tease him about eating quiche (apparently it’s a girly meal). So moral of the story… it was pretty much amazing for dinner, as well as leftovers for lunch the next day, and brunch today! The whole time I was eating it – I elicited images of Julia Child, weird. I will definitely be making this meal again and probably serving it at my next brunch gathering with friends. For my pastry dough purists out there.. I reluctantly have to tell you that I didn’t make my own pastry dough for this. I know, I know… the shock! the horror! I had a leftover pie shell in the freezer from my holiday pumpkin pies, so I used that instead. Plus, I don’t own a pretty quiche pan. But, that one shortcut alone made this an easy meal to throw together for a weeknight meal. I had bacon left from the gluten free/dairy free Potato Leek Soup I made a few days ago, as well as spinach and basil that I wanted to use up in this recipe. So now you see why my Quiche Lorraine was fortified with additional yummy goodness. And now you have it.. the recipe. Make it, eat it, weep, and change a few people’s minds about quiche. Servings: 8, but it’s pretty tasty..you might want more. 1/2 lb. bacon – cooked, drained and crumbled. Reserve about a tsp. of bacon grease. 1. Take pie shell out of freezer. Prep ingredients above. Preheat oven to 375° and make sure oven rack is on center position. 2. Cook bacon in skillet until crisp. Take out of pan and place on paper towels. Drain bacon fat, but reserve about a teaspoon in pan (you will cook additional ingredients in this). When cool, crumble or chop up bacon. 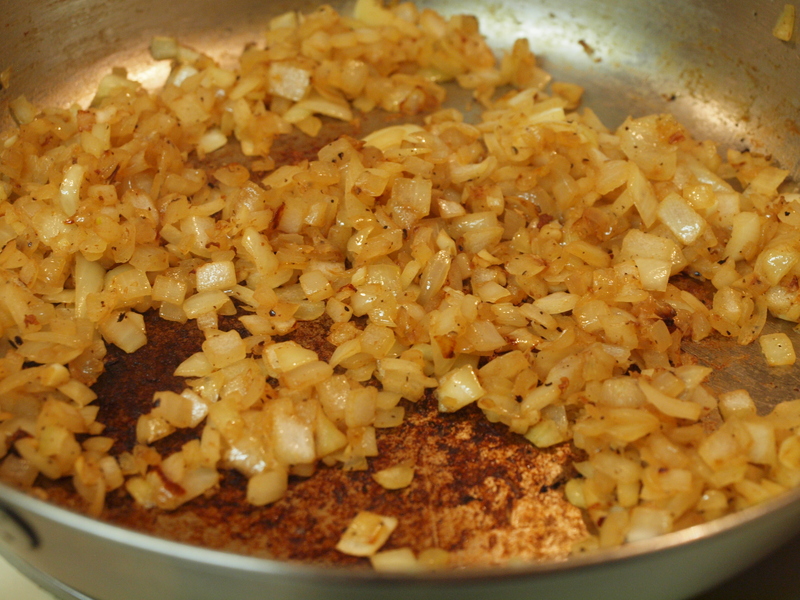 Now you know I don't have fancy pans, but I can show an onion a good carmelization. 3. Heat pan with reserved bacon grease on medium heat. 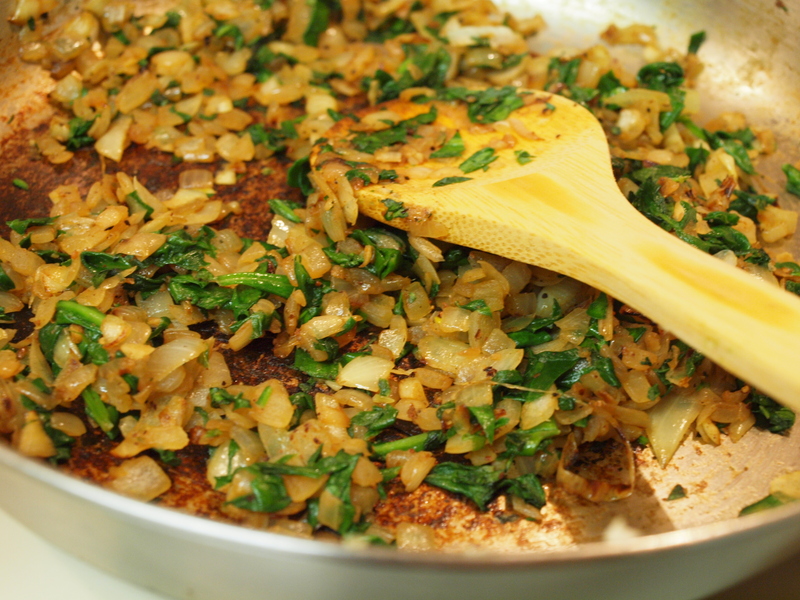 Add onions and garlic to pan and cook until carmelized, it should be light brown in color. Caramelized onions meet Spinach. Acquaint yourselves. 4. Add fresh chopped spinach to pan and stir. Add a pinch of kosher salt and fresh ground black pepper and stir. The little bit of salt will help draw the moisture out of the mixture so that it doesn’t make the eggs “watery”. Cook until leaves wilt and moisture cooks out. Add the nutmeg and stir. 5. Crack eggs into a medium sized bowl (or stand mixer) and add cream. Blend the eggs and cream together on low speed for about 15 seconds until it is well beaten. Mix in (by hand) the onion/spinach mixture, bacon, cheese, and basil. Add a pinch of kosher salt and black pepper. 6. Place pie shell on baking sheet. Pour egg mixture into pie shell. Tent the foil over quiche, making sure to cover the crust on all sides to keep your crust from burning during the baking process. Carefully place the baking sheet and quiche into oven (My egg mixture sloshed a bit, but at least it was on the baking sheet and not on my floor or oven). 7. Cook for 35 – 45 minutes. Check after 35 minutes. Quiche is done when egg mixture is set and doesn’t jiggle easily. 8. Take quiche out of oven and let sit for a few minutes prior to slicing and serving. You will notice that when it was in the oven the egg was fluffier, it should set a bit for a flatter top once it is cooling. Slice and garnish with chiffonade of basil or sliced green onion. I served this with a spinach salad. Posted in Affordable Eats, Baking, Brunch, Palate Pleasers, Weeknight Dinners and tagged 9" pie shell, aluminum foil, amazing brunch recipe, artificial ingredients, bacon, basil, Basil Quiche, best potato leek soup recipe, best quiche recipe, Black pepper, Bob's Red Mill, Bob's Red Mill brownie mix, breakfast, brunch, brunch food, brunch gathering, brunch quiche recipe, brunch recipe, caramelized onions, cook, cooked bacon, cooking quiche, cooking with eggs, delicious mix, deviled eggs, dinner quiche recipe, egg brunch recipe, egg meals, egg recipes, egg-y, eggey, food, free range eggs, French cooking, french quiche recipe, french recipe, frozen pie shell, garlic, girly food, grain fed eggs, green onion, ground nutmeg, Gruyère, heavy cream, heavy whipping cream, holiday pie, Home, homemade french food, homemade quiche, homemade quiche lorraine, Julia Child, keep pie from burning, keep quiche from burning, kosher salt, Lorraine, meals made with eggs, non-watery quiche, nutmeg, onion, organic eggs, pastry crust, pastry dough, Pearl District, perfect quiche tips, pie crust, pie dough, pie shell, Portland Oregon, Portland Oregon quiche, Portland tea shop, pre-made pie shell, pumpkin pie, Quiche, quiche filling, quiche haters, Quiche Lorraine, quiche lorraine recipe, quiche pan, quiche recipe, quiche tips, spinach, spinach quiche, swiss cheese, tea shop, Tea Zone, Tea Zone Portland Oregon, Tea Zone quiche, Trader Joe's, vegetarian fed chickens, watery quiche, weeknight dinner. Bookmark the permalink.